We offer fully equipped 1 - 4 bedroom cabins and units on beautiful Table Rock Lake and our resort is minutes away from Branson entertainment and Silver Dollar City. Green Valley Resort is your home away from home! 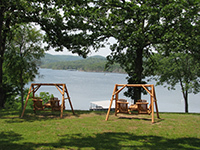 It is located on a beautiful peninsula point of Table Rock Lake and is surrounded by over six acres of park like grounds which slope down gently to the shore-line and the boat dock area. We have 21 fully equipped 1-4 bedroom and 1-2 bath room units and cabins. Some of them are right on the Lake! Pontoon boats and boat slips are also available for rent. Green Valley Resort is a great place to meet families and have fun!